It's been cooler than last year at this time. Stay warm, everybody! Also please don't forget I have a giveaway going on so please feel free to enter! How sweet, she's very pretty! Look at her in her robe and slippers ~ so cute!! Adorable pictures! 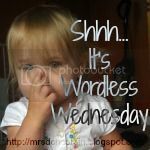 I came over from another Wordless Wednesday link up. Nice to meet you today! Such a little doll!! I have awarded you the Liebster award!! Find more details on my blog! http://www.dayswithdylanandkc.com/2012/11/liebster-award.html I'm also your newest follower! Cute that she loves it so! New follower and excited to look around! Thanks for hosting the linky! Too cute!!!! Although I don't have a specific picture to post this time, I enjoy checking your out. she is a cutie.... :-) Happy WW!!! Hope I'm not to late, to say these are great shots. Thanks for hosting, we just linked up. Gorgeous captures. Visiting late for WW.